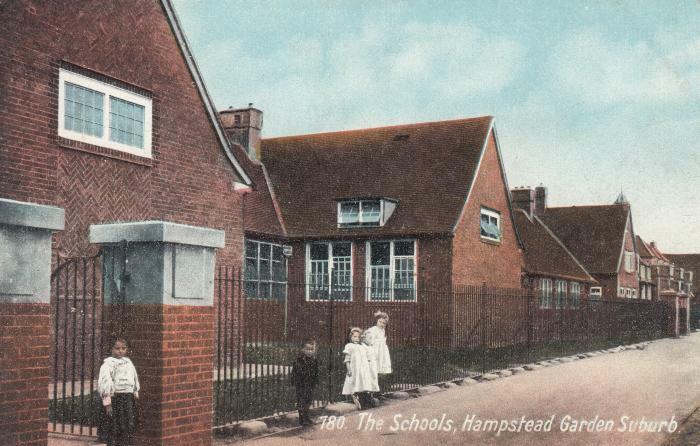 Postcards of Garden Suburb school, part of the Raymond Lowe collection. The Garden Suburb School is the oldest of the schools of the three main schools in the Suburb. It is often wrongly called Childs Way School or Hampstead Garden Suburb School. The nearest part of the building on the card was destroyed during the blitz and rebuilt after the war in a different style to the original building. The railings have long since gone and the space in front ofthe railings is now part of the school playground. During the 1939-1945 war blast shelters were built in the playground near the footpath from Childs Way to The Green. Of the three class room cards, the least faded card of 1914, shows Frank Faulkner second from the left one row from the back. Kate Seabrook, a friend of Edith Faulkner is in the middle of the row in front of Frank. In the boys class 1915? Frank is forth from the right in the third row from the front. The third and most faded card shows Edith in the third row one from the left.